In Windows 10, when you create a new user account, Windows 10 automatically makes the new user account as the standard user account. In fact, Windows 10 doesn’t offer an option to choose the type of the account while creating a new user account. A standard user account is nothing but an account with some restrictions. People using a standard account can create, edit and save files. However, they might not be able to install and uninstall apps and make changes to system settings including user accounts. 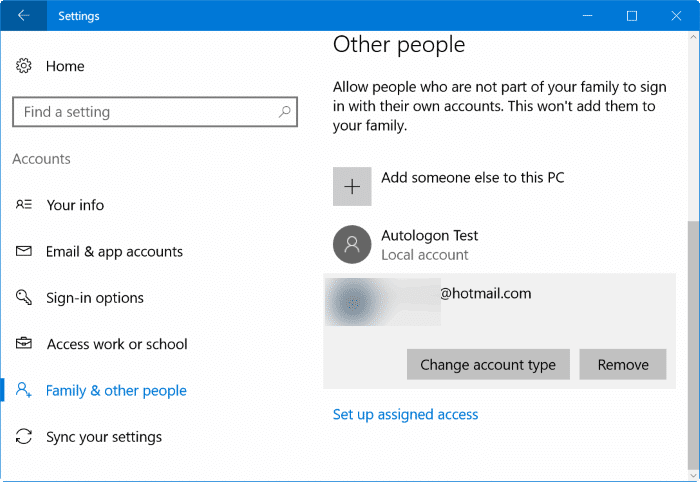 An administrator account gives full control over your Windows 10 PC without any restrictions. If for some reason, you want to make a standard user account administrator account or want to change admin account to standard user account, you can do so under Settings and Control Panel. It’s important to note that you must have admin rights or sign in with an admin account in order to change the account type in Windows 10. In other words, it’s not possible to make a standard account administrator account from a standard user account. 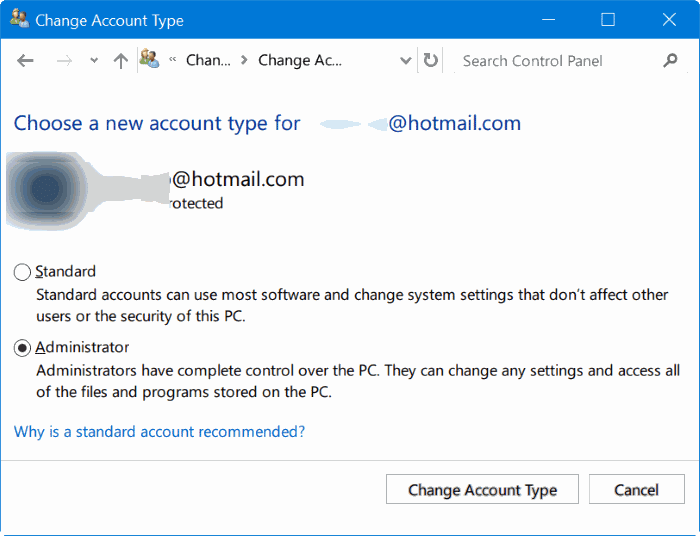 Here is how to make your standard user account administrator account in Windows 10. Step 1: Open Settings by opening Start menu and then clicking Settings icon (gear icon). Step 2: Navigate to Accounts > Family and other people. If you are on Enterprise edition of Windows 10, please navigate to Accounts > Other people. Step 3: Click on the standard user account which you want to make administrator account to see Change account type button and Remove buttons. Click Change account type button to open Change account type page. Step 4: Here, under Account type, select Administrator account. Finally, click OK button to make the selected standard user account administrator account. Simple as that! Step 1: Open Control Panel by following the directions in our five ways to open Control Panel in Windows 10 guide. Step 2: Change the View by to Small icons. Click User Accounts to open the same. Step 3: Here, click Manage another account link to open Manage Accounts window where you can see all user accounts on the PC. Step 4: Click on the standard user account which you want to make an administrator account. This will open Change an account window. Step 5: Click Change the account type link. Step 6: Finally, select Administrator account. Click Change account type button to change the selected standard account to administrator account.